Ever since my son was born, the C word loomed in the back of my mind, and we were all too terrified to breathe it. After having my daughter, who turned out to be a complete little angel, I was sure I would be paying for it with my son. There was no way I could get away with having two little blessings who hardly ever cried, and were content practically all the time, sleeping through the night at merely a few months of age. I had heard all the stories about children with colic. I have friends who suffered through months of prolonged, unabated crying. These babies were inconsolable. For me the worst part is not the crying in itself, but the pang a mother feels when she sees her little one so distressed and cannot do anything to soothe them. This was my biggest fear. All the books say that colic usually commences around the third week, and I waited, practically holding my breath when the time came. Last night, as my son turned six weeks, I exhaled. He certainly cries more than my daughter ever did, but it is a far cry from colic. For all those parents out there who are not so lucky, hang in there. You are doing great, and it will pass. I know that is easy for me to say, not having gone through it, but having witnessed it with others, I know there is a light at the end of the tunnel, even if you cannot see it yet. 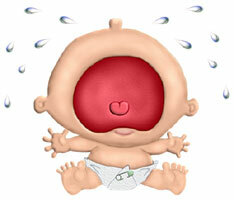 Did your baby have colic? What did you do?